By targeting the BJP's Ram temple agenda, Upendra Kushwaha has hinted that his days within the NDA are all but over. M I Khan reports from Patna. 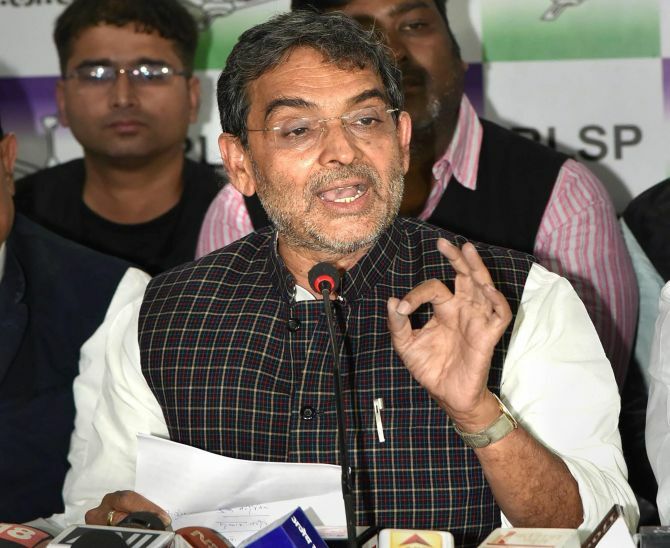 Bharatiya Janata Party ally Rashtriya Lok Samata Party chief and Union Minister Upendra Kushwaha on Thursday opposed the BJP's stand on the construction of a Ram temple in Ayodhya, saying it is not a political party's job to construct a temple or a mosque. Sources in the RLSP said Kushwaha is likely to meet Congress President Rahul Gandhi on December 10 in New Delhi. After that meeting he will announce his resignation as Union minister. "Mandir banana political party ka kaam nahi hai (It's not a political party's job to build temples)," Kushwaha said while addressing his party leaders and workers on Thursday, December 6, in Motihari, district headquarters of East Champaran in Bihar, at the end of a three-day chintan Shivir. Kushwaha, who was expected to formally announce the decision to quit the National Democratic Alliance on Thursday, targeted the BJP's Ram temple agenda for the first time and hinted that his days within the NDA are all but over. "The BJP has been deliberately trying to raise the temple issue for political gain. "This issue is to divert attention of people from real issues like education, health, employment, growth and development," he said. "The Ram temple issue should not be raised during the run-up to the 2019 Lok Sabha polls," Kushwaha asserted. The RLSP, he said, is opposed to the BJP's 'move to polarise society' in the name of constructing a temple. "The RLSP is not against construction of a temple, but it should be constructed as per the law of the land," he said. On Wednesday Kushwaha said he was authorised by his party leaders to take a final decision on whether to continue with the NDA or not.